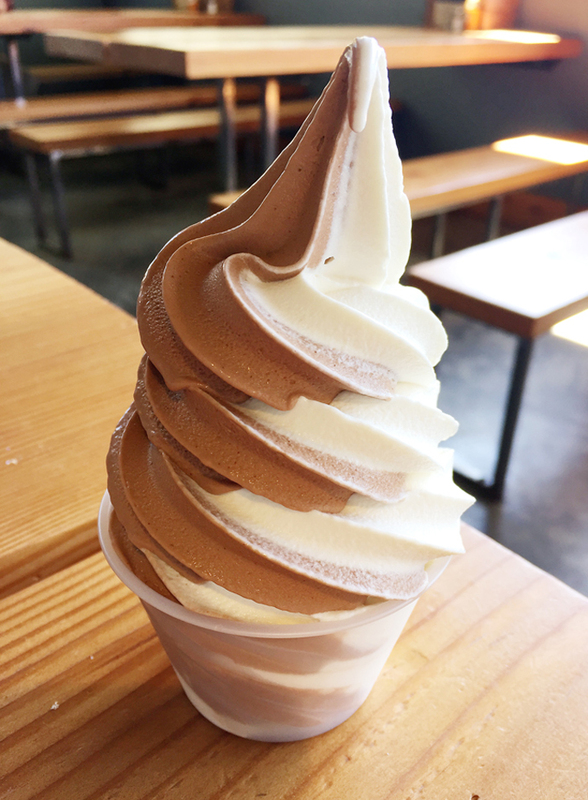 Enjoy soft serve and a whole lot more at Handline. 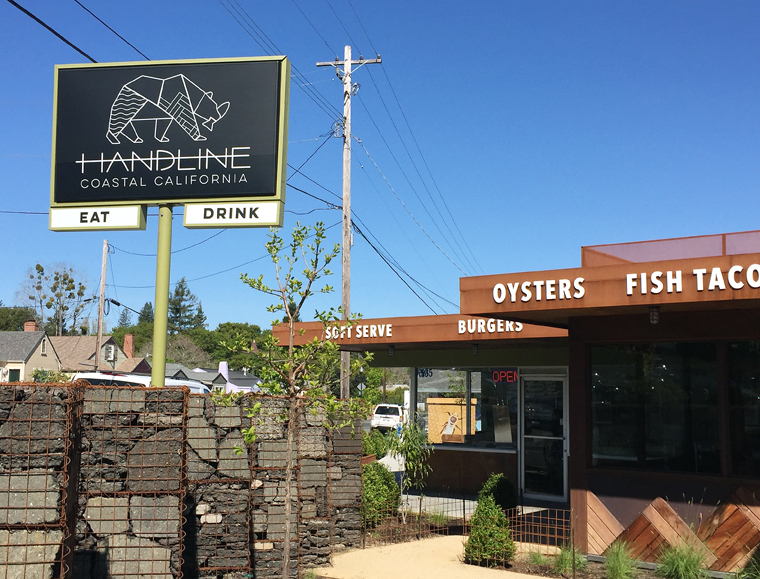 Sebastopol, CA — On a summery day in this Wine Country town, there’s no better place to plant yourself than at a table at Handline, the sunny restaurant that opened last year in an old Foster’s Freeze. Restaurateur Lowell Sheldon and his girlfriend Chef Natalie Goble also operate the decade-old Peter Lowell’s nearby. I was invited earlier this spring to be a guest at both of the restaurants. 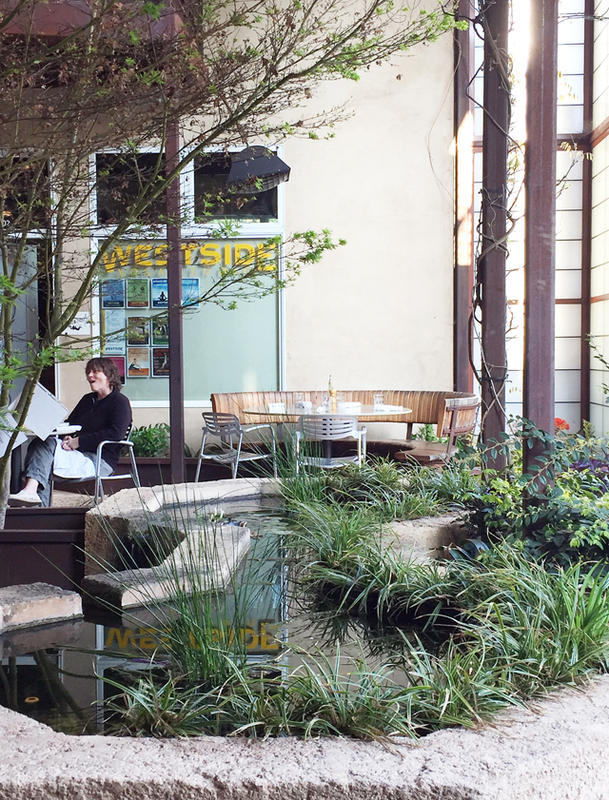 You’ll almost always find a crowd at this breezy restaurant, which has plenty of outdoor seating and windows that open completely to let the outdoors in. 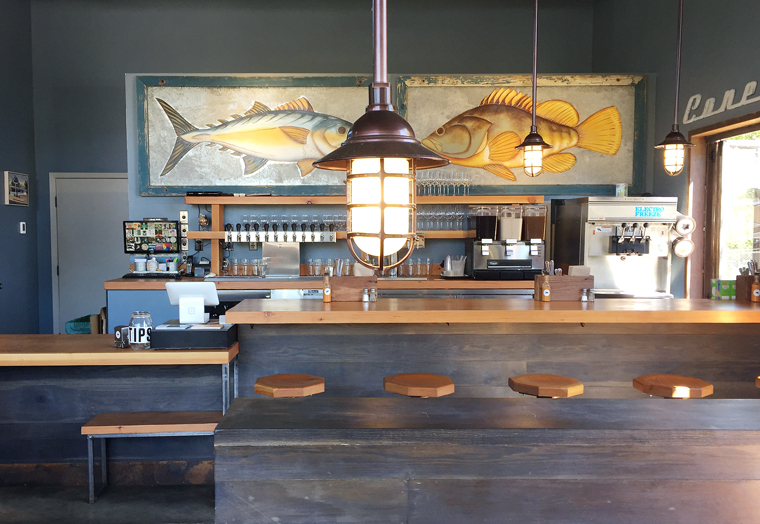 Order at the counter, then find a table, where your food will be brought to you. The small parking lot fills up fast, so go early, if you can. It specializes in California coastal cuisine. Much of the produce at both their restaurants is sourced from their own farm, which grows everything from tomatoes to squashes to kiwis. Goble learned the art of tortilla-making from the folks at El Molina Central in Boyes Hot Springs. Like them, she also starts with masa made from scratch, which makes all the difference in bringing out the true corn flavor. Taste for yourself in an assortment of tacos on the menu. They come two to an order, though, in our case, they let us order just one so we could try more of them. 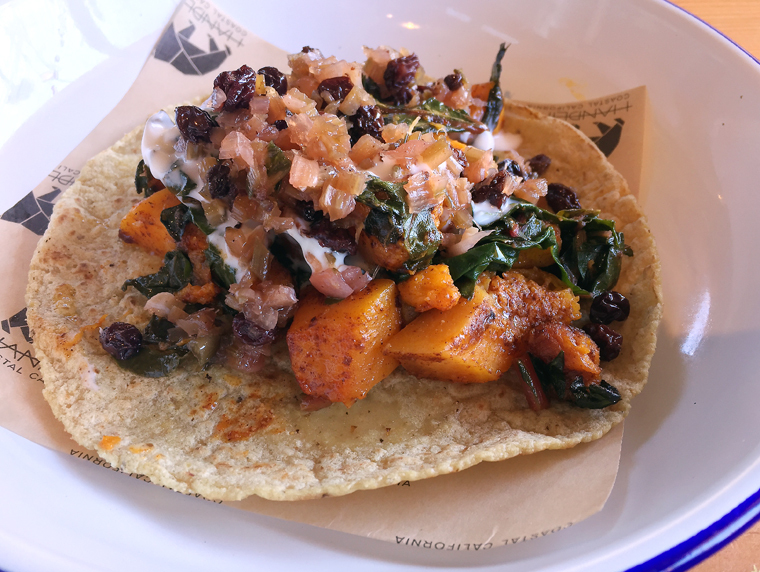 The Ex Pat ($9) stars their farm’s pumpkin, roasted until soft and sweetly caramelized, piled with braised greens on a tortilla with crema and black currant salsa. It’s a soulful bite of sweet, creamy and fruity. 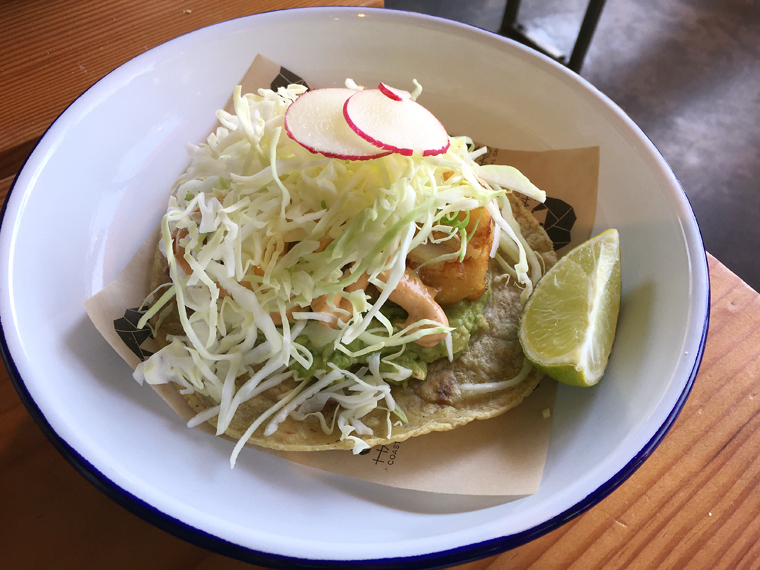 The El Coronado ($12) are beer-battered rockfish pieces with an expert fry on then, accented with chipotle aioli, avocado and cabbage on a tortilla. For anyone who loves fish tacos, these will definitely satisfy. 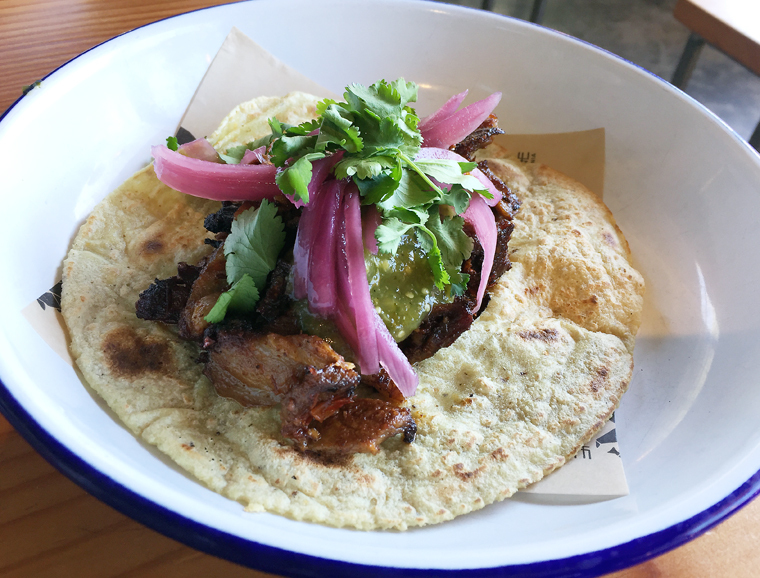 The Los Cabos ($12) is smoky al pastor with pickled onion and salsa verde heaped on a tortilla. Best yet, the bits of fat on the pork get all crunchy, making them a delightful treat whenever you hit one. 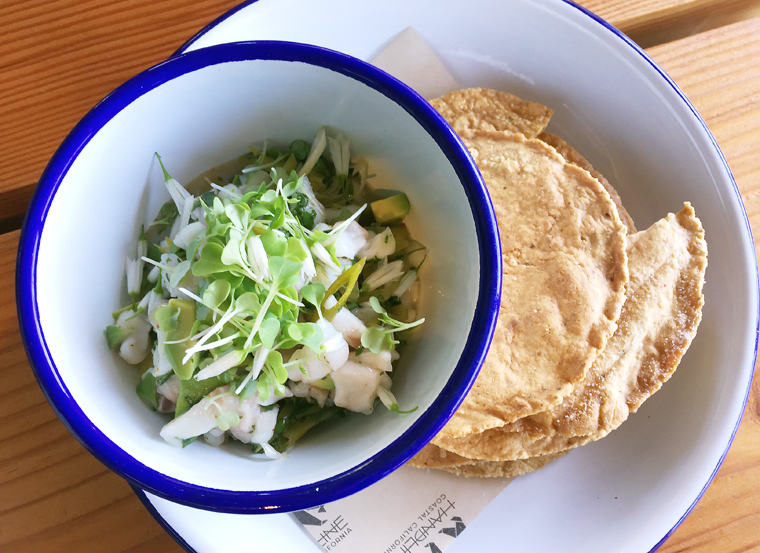 Rosarito’s rockfish ceviche ($14) is a must-order. The fish is silky, and the whole dish so lively, thanks to a good does of lime. This is fresh at its best. Rockfish ceviche with housemade chips. 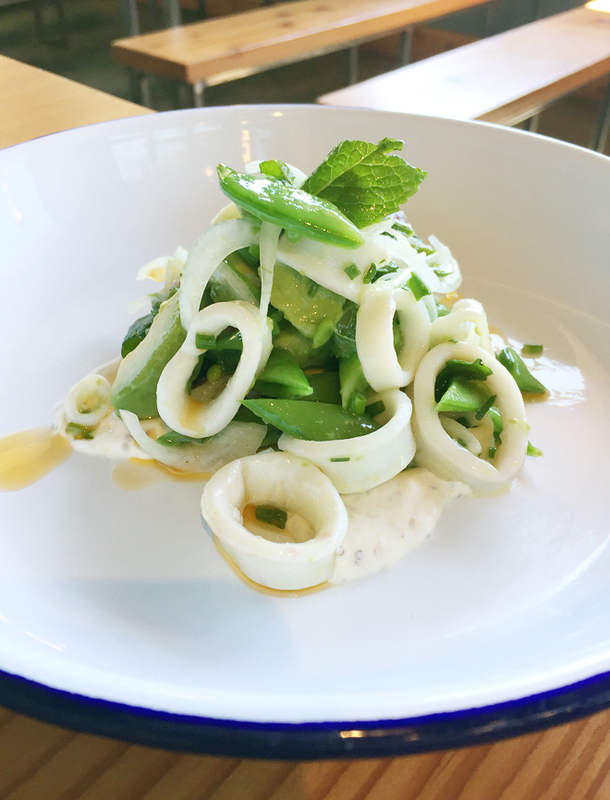 La Sirena ($13) is a tangle of the most tender poached calamari mingled with sugar snap peas, spring onions, mint, mustard, creme fraiche, and avocado. Calabrian chili oil adds just enough heat. The snap peas are an inspired touch, adding crunch, sweetness and a vivid taste of spring. Being a former Foster’s Freeze, Handline wisely still offers soft-serve. Only it’s organic Straus soft-serve. You can get it in vanilla, chocolate or swirled ($4.50). But just get it. The couple’s other restaurant, Peter Lowell’s, is a sit-down affair, but still with a casual vibe.The back patio has shoji-like screen doors that can be opened up to the street. There are also heaters overhead for when the evenings get chilly. The back patio at Peter Lowell’s. When Peter Lowell’s first opened, it was a vegetarian restaurant. But no more. Though, you will find plenty of vegetarian dishes still on the menu, such as the popular Macro Bowl ($13) of greens, beans, brown rice, root veggies and a protein of your choice, anything from seitan to sausage. Chef Joe Zobel butchers all the meat in-house, too. 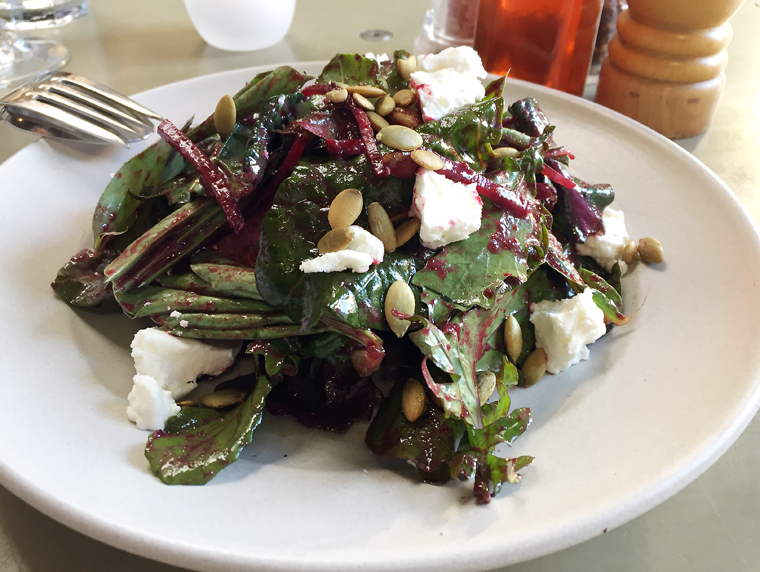 Gemischter Salat ($10) is the signature salad that showcases the hearty greens from the farm picked that day. Bitter chard leaves are balanced by a sweet-earthy beet vinaigrette and dollops of creamy goat cheese. The signature salad made with greens grown on the restaurant’s nearby farm. 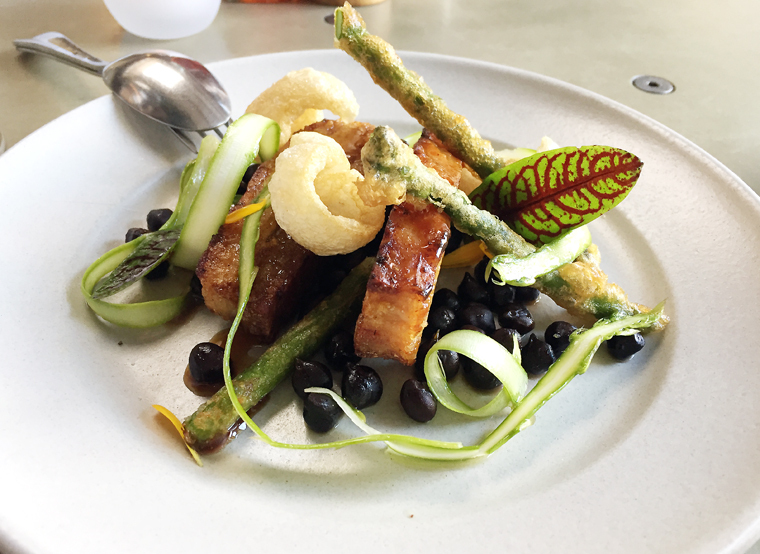 Dreamy pork belly with tempura asparagus. The pork belly ($16) is outstanding — juicy, sticky, and super flavorful. Curly chicharrones and tempura asparagus add crunch, and amplify the dish’s richness. 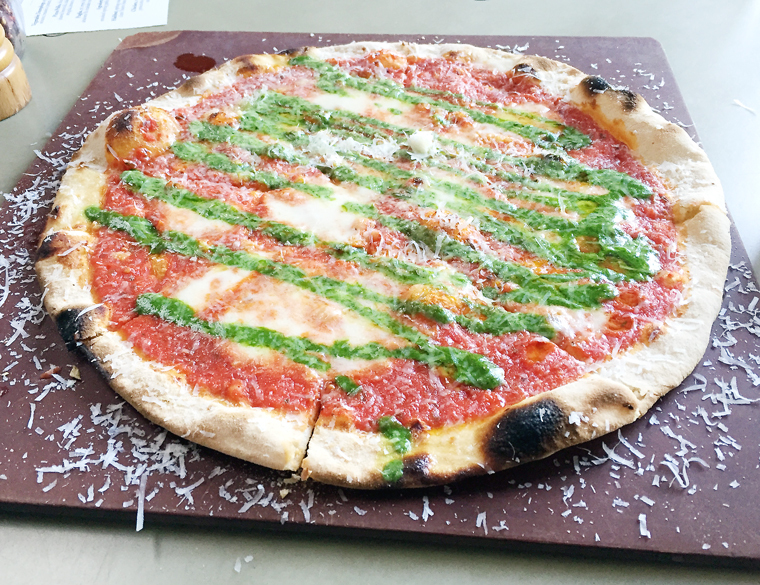 Neopolitan pizza ($15) of marinara and mozzarella gets a twist with fava bean pesto, which adds a grassy freshness. Pizza with fava bean pesto. 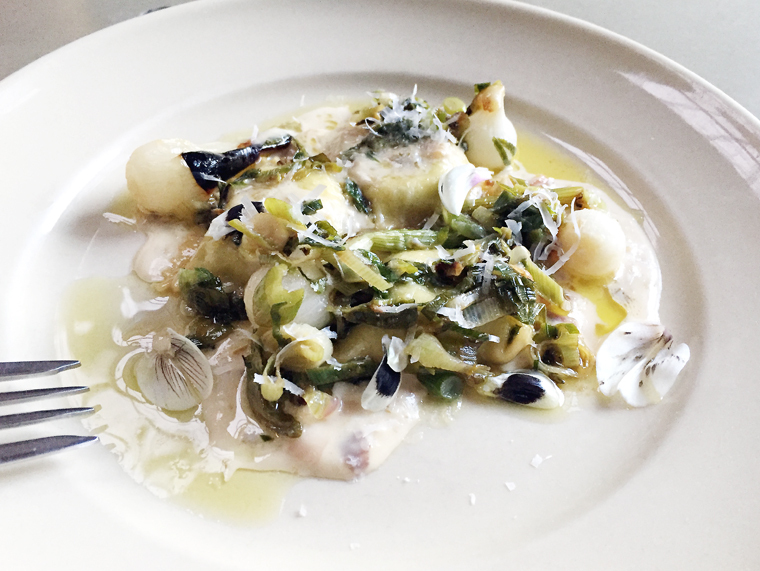 Agnolotti ($20) are tender, delicate little pocketfuls of ricotta and asparagus. Puddles of smoked spring garlic fonduta dot the plate, adding just enough gooey cheesiness without being too heavy. Desserts are limited, but still satisfy. 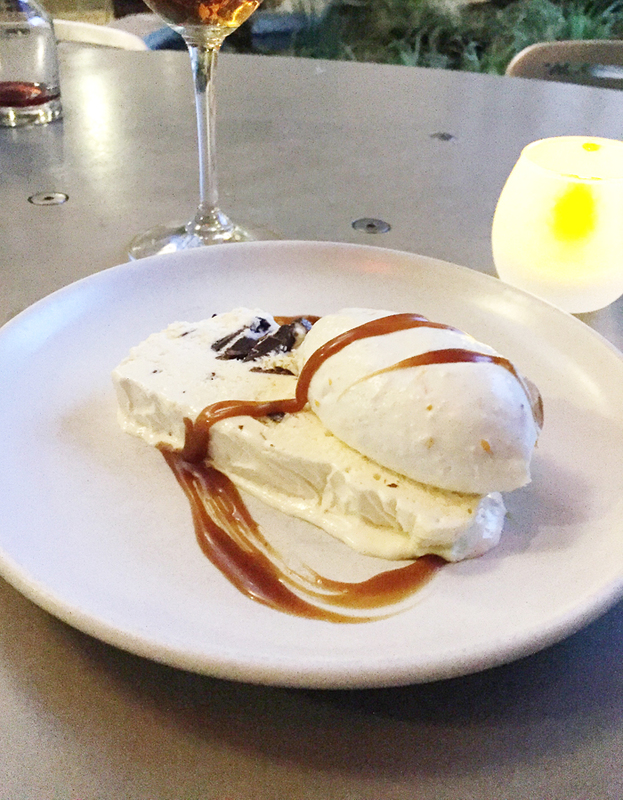 Enjoy a big sea salt chocolate chip cookie or a chocolate chip semifreddo drizzled with caramel. Both make for laid-back last bites for a place that definitely makes you feel at ease. Great to see more fun dining options there!